The swim was located in Alta Lake, which is an absolutely gorgeous mountain lake, with the backdrop of several peaks in the distance. The professional women’s race started 5 minutes behind the professional men and 5 minutes before the mass start of the age groupers. It was my first professional international Ironman and I was quickly reminded when they played the Canadian National Anthem before the start. It was a deep-water start. Therefore, all the women were treading water try to stay warm and keep a good starting position. Finally, the count down began: Three, two, one, Bang! We were off! I managed to have a descent start and was swimming with a group of gals for the first 300 meters but ever so slowly they started to get away from me. I put in an extra surge to maintain distance and tried desperately to get back on some feet but the gap only continued to grow. I was on my own and I had to stay focused on long, strong strokes. The swim was two loops, so by the second loop some of the seriously fast age-group swimmers started to catch and pass me. I was not able to stay on their feet very long but it was wonderful to have company and this helped me quicken my pace again. I exited the water in 8th place with the time of 1:01:49. I rushed up to the water’s edge and started unzipping my blueseventy Helix wetsuit and taking off my cap and blueseventy goggles. I raced over to my bike bag and with the help of two wonderful women volunteers we put on my helmet, sunglasses, arm warmers, socks, and biking shoes from Wheat Ridge Cyclery. I raced to my bike, which was hanging on the rack with a few other women’s bikes. I was very pleased to not be the last women out of T1 this time. As I was running my bike to the mount line, I quickly realized how heavily the rain was coming down and how the temperature had dropped. We were in for a hard, grueling, and cold 112-mile bike ride. Being from Colorado, I am used to riding in the rain. Before the race I was praying for tough conditions because I knew it would play to my favor. My prayers were answered! Once it started to rain hard on the bike, I was super stoked! The colder and more miserable it became, the stronger I felt because I knew everyone had to deal with the same conditions. I knew I was in charge of my mind-set and by viewing the situation as a positive, I would immensely benefit. Never underestimate the power of choosing happiness! I continued to gain on the field and pass several girls up to the halfway point. 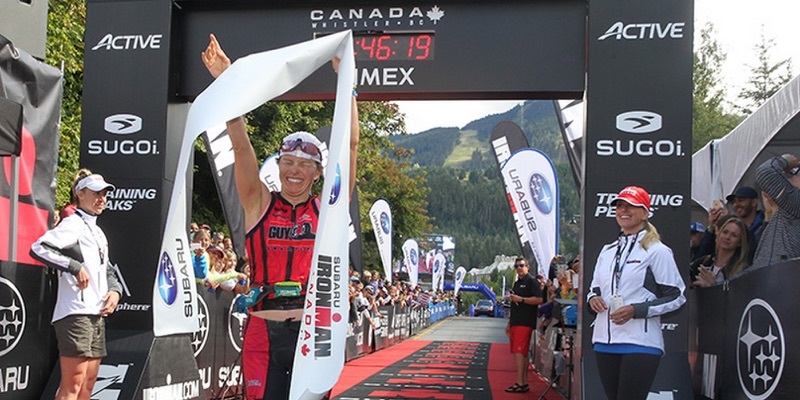 Ironman Canada has several steep climbs and since this is an out-and-back type of course, everything you go up, you must come down. The downhill sections were wicked cold and hard to see where you were going with all of the rain. I just thought back to all the countless training days in the rain, which allowed me to descend with confidence. I did not wear gloves so that I would have better grip with my hands both for holding onto the bike and when reaching down to grab a water bottle for a sip of EFS Pro. This thought process would have been correct, except for my hands became so frozen I could no longer feel them gripping anything and nearly lost my bottles several times when trying to take sips and place them back into the water bottle cages. Eventually, it got so bad that I would only reach for my bottles at aid stations in the event I did drop it, I would not risk a littering penalty. The numbness in my fingers became so intense I could no longer feel if I was shifting or not and was relying on hearing my Di2 make the switching sound to know indeed I was successful in the shift. When I arrived to special needs, I was right in front of several of my fellow women competitors. I yelled out my number 37, and the volunteers were on top of it with my bag ready to hand off but once I reached for the bag, I knew my hands were too frozen to get my new full, heavy bottles into the water bottle cages properly. I had to come to a complete stop to fumble around to get them in without dropping them. I have never had to stop in the past; this was a new experience. Finally, once I had my new bottles with 6 scoops of EFS Pro and my full EFS Liquid shot safely secured, I got back on my bike and with my first down pedal stroke my chain fell off. My special needs bag was so close to my chain it blew into my chain causing me to drop it. Now, it is nearly impossible to get a chain back on your bike with frozen fingers. The seconds continued to tick by and my pack of gals just continued to ride further and further down the road. After what felt like eternity, my chain and I were back on the bike. However, no girls were in sight and I had lost lots of time! I knew I needed to stay up on my nutrition if I was going to stay strong throughout the whole race. I made an adjustment on the fly taking in more EFS Liquid Shot then what I was accustomed too, so that I was getting in the extra calories I needed to counter my body shivering on the bike. At mile 80, I hit a real low. My power started to decrease and my energy level was dropping quickly. Luckily, it stopped raining so my hands could ever so slowly defrost and I could drink more rapidly again. The last 20 miles of the bike course is predominately made up of a long, steady ascent. I had ridden this section earlier in the week and I knew I needed to really push to make up some time on the girls. 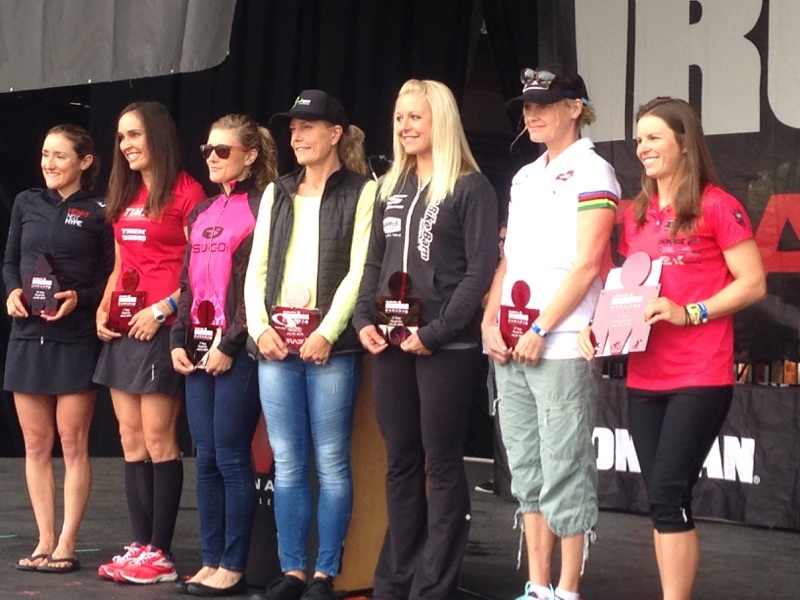 I managed to re-catch several of the women and put myself into 3rd place off the bike. I was just seconds behind 2nd place and a few minutes ahead of 4th with the time of 5:23:53. In transition, I again had two great volunteers help me take all my biking gear off and replace it for my Hoka running shoes (Cliftons), socks, Boulder Coaching hat and racing belt. The woman in second, Jessica Fleming sprinted out of transition at a blistering 6:30 pace, I stayed with her for about ½ mile then realized I needed to settle into my pace and not get out of control. Even though I slowed down to a 7:10 pace I took over second right after the first mile. I had an incredible lead biker who made sure the path was clear for me and I would not have to run through any pedestrian traffic using the bike path. 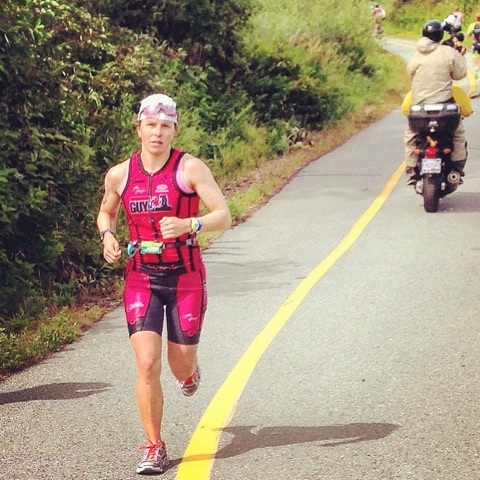 Once I was in 2nd all my energy and focus was on taking over first place, Melanie McQuaid. The entire run I knew it was possible to catch her, but it would require patience and persistence. I could not falter at any point on the run. I know that, “Through God All Things Are Possible”. I was hungry for this race, I had worked extremely hard in training and I was prepared both mentally and physically to have an outstanding race. I just needed to just stay positive and stick to my plan put into place by my outstanding coaches, Simon and Lisa Lessing and Darren and Colleen De Reuck. I continued to run smart but every time I was receiving an update I continued to loose time to Melanie. After the halfway point, I was a whopping 6:45 back. Melanie is an extremely tough competitor and was making me work really hard! As I proceeded down the trail to special needs, I was shouting my race number but the volunteers were not able to hand me my bag as I ran past. I was so focused on gaining every second I could not fathom stopping to get my bag; in my mind it was not an option. However, this was a big risk to proceed without my special needs, which included more BASE Salt, and EFS Liquid Shot. I would need more of both by the end of the race. I started to panic when the realization of my decision started to settle in about half mile away from special needs. When I lost all hope of recovering my special needs bag, I heard a pitter patter behind me of a young girl sprinting with all her might, yelling “37, 37, here is your special needs bag”. I am not sure if I was able to mutter “thank you”, but inside I was rejoicing because I knew she just saved me! I was fully re-stocked and ready to start reeling in Melanie. I started to quicken my pace and was feeling good; I was finally into a rhythm. However, ahead was some train tracks and even though the race had put in a request to stop the trains they had no control over if the trains were actually going to be in operation or not. I could see the train coming off in the distance and even though I pushed into another gear, it was evident I was not going to make it across in time. Again, back to waiting. Looking back it is pretty comical…what were the odds? Yet, I did not think it was comical at all, in the moment. I tried my best to stay as calm as possible because I knew the more upset I became, the tighter I would get and it would only make running harder for me, giving Melanie an advantage. “Ok, I got to stop and rest up for about 55 seconds, now I really need to make a move.” I was very relieved to hear that even with the train incident I had put more time into Melanie and was catching her. At the last turn around, I could see she too was pushing as hard as she could. Before the race I told Jeff this race was dedicated to him, so I was determined to give it everything I had for him. I thought about my body position and running effortlessly. It was anything but effortless but the thought was at least comforting. Finally, I was getting updates that I was coming in fast on Melanie and if I maintained the same pace I would indeed catch her. When I could finally see her ahead of me with just over 4K to go, I dug extra deep to make a definitive pass. Even though I surged past her and could hear her footsteps fading in the distance my mind was acting as if I was still in second place and was on a mission to get to the finish line as quickly as possible. It was as if my mind knew my body was starting to shut down and I needed to get to the finish, NOW. I was still feeling good at this point but with 2K to go I was consciously aware that my body was absolutely shutting down. Every step became super painful. I was thinking “Dear God, please let me just get there!” Finally the finisher tape was within sight. I was able to do a short celebration down the finisher shoot before finally reaching for the finish line! Even with the excitement and enthusiasm of winning, holding the tape above my head physically hurt. I had nothing left, it was all laid out on the course. I was quickly taken to medical where I was informed that my temperature was a mere 91.4 degrees. Thank goodness for the extra calories of EFS Liquid Shot, because without them, it was very clear I would not have made it to the finish! I had several fantastic medical staff members bundled me up in warm blankets and used hair dryers to try to warm me up for 1.5 hours. My body was rebelling and it was excruciatingly painful. Yet, with the knowledge that all my hard work this season finally paid off really helped me cope. Finally the medical staff got me back on my feet and I could really take in the glorious feeling of victory! It takes a ‘village’ for an athlete to be victorious! I am forever grateful for my amazing sponsors, Hoka, First Endurance, Boulder Coaching, Wheat Ridge Cyclery, Garmin, blueseventy, Transformation Massage, Pro Bike Express and Z- Health. I want to send out an extra special thank you to my title sponsor Guy Chemical. Without you this entire journey would not be possible! Thank you so much to my parents, family, coaches, friends, training partners and fans. Your words of encouragement and support goes way further then you can imagine. I want to especially thank a dear friend, one of the very best training partners anyone could ask for, who always radiates with positive energy, Kelly Ryan! Thank you to all the volunteers who came out in torrential conditions so we could have a fantastic race! You are our Earth Angels! 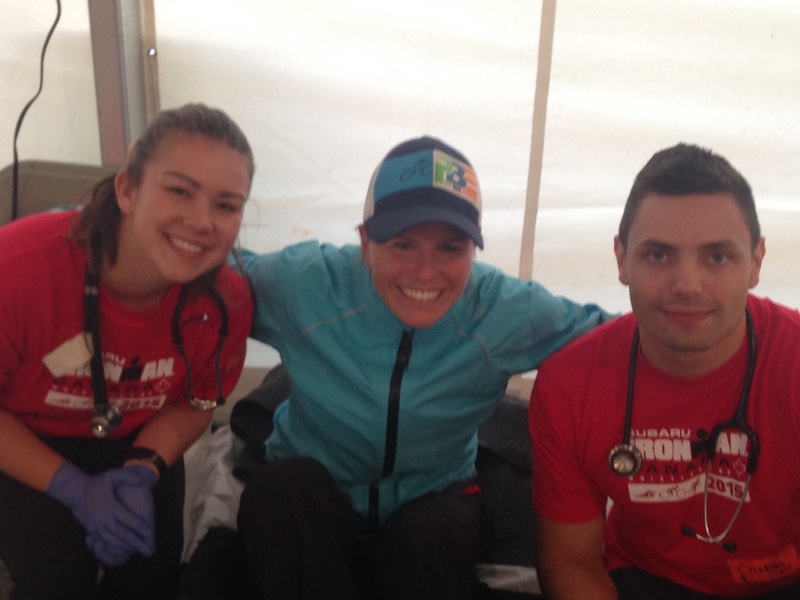 Thank you to Evan Taylor, Subaru Canada’s Race Director who put on an outstanding race! I want to extend a huge thank you to all my female competitors. I felt so blessed to get to compete in such a talented field of women. You each helped push me to my limits and I am so grateful to each and every one of you! You are all very tough and I hope to race each of you again soon! I always race for Mother Mary, God and my fleet of Angels who are always with me. Finally, I want to thank my soul mate, my rock, my Husband Jeff Mack, who has been beside me every step of the way! I thank God everyday for the love of my life; this race was for you Love!!! !